An Uncommon Protector is the second installment from the Lone Star Hero series. The War Between the States was hard on Lauren Tracey. She loses her mother, father, and her brother. She has inherited a 200 acre ranch-a ranch that she is running alone. She decides to free Thomas Baker from jail and hires him for a year to help her on the ranch. The two have to solve a mystery of why her cattle are suddenly dying. Could they find that their own lives are in danger? 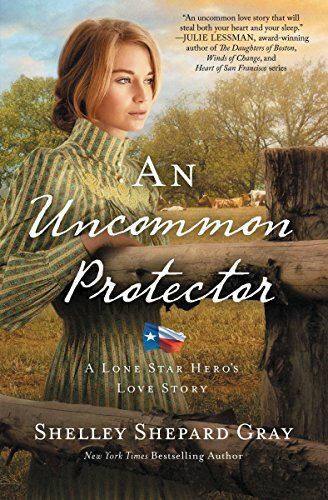 I thought An Uncommon Protector to be a pretty good read. I liked Lauren from the start and enjoyed the chemistry between her and Thomas. Even though Thomas was just released from jail, I still felt that he was a good man. He would do anything to protect Lauren, making me love him more and more throughout the book. The story is full of historical details that I felt like I was transported back in time. There are some mystery and suspense that kept me wondering what would happen next. I think this is the best book I have read by Shelley Shepard Gray yet. A great, clean, historical romance. I received this book from the publisher. But was not required to write a review. This review is 100% my own honest opinion.